Avocado trees benefit from pruning during the first two years to encourage branching. 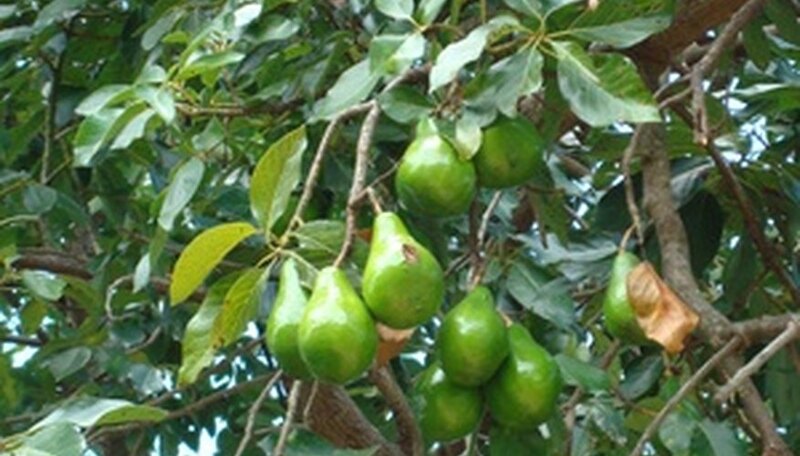 When the tree has produced several crops of fruit, it is desirable to remove the entire top of the tree, then prune yearly to maintain the tree at a workable height. Without this pruning and topping, avocado trees grow to be 40 to 80 feet in height and harvesting the fruit becomes difficult. Snip the top of the avocado tree off when it reaches approximately 12 inches in height, cutting the tree back to 6 inches. Allow the tree to regain its original height then repeat the trimming. This pruning will encourage lateral branches to develop. Prune the tree during the winter, forming a pleasing shape and removing interior branches that block the sun. Trimming the outside of the tree will limit the following year’s crop. Remove damaged and dead wood, cutting just above a healthy bud. Remove entire branches by cutting flush with the swelling of the branch collar. Cut the top of the tree off after several years of fruit production. Cut the tree back to 10 to 15 feet, or to a reasonable height for easy harvesting. Cut off the tallest branches each year to keep the tree height manageable. Cut flush with the branch collar using a hand saw. For branches larger than 1 1/2 inches in diameter, use a three-part cut. Cut first from below the branch, approximately 12 inches from the trunk. Cut again from the top, approximately 9 inches from the trunk. The branch will split between the two cuts. Remove the branch and make a new cut flush with the branch collar. Major pruning is done during the winter, or immediately after harvest. Light pruning tasks can be done whenever needed. After a heavy pruning, the trunk and branches should be whitewashed to protect the exposed bark from sunburn. Paint the newly exposed wood with a diluted white latex paint. Mix equal parts of paint and water and spray or brush onto the exposed trunk and branches.